It's there, in the market of Sanremo where one starts to feel really in Italy. That delicious smell of basilica, dried tomatoes and ripe melons. And the various sized cuore di bue tomatoes, of course. The vendors smile as they offer plates of little squares of bread daubed with delicious sources such as pesto alla salvia, pesto Ligure or clever concoctions of pomodori con funghi or con acciughe saturated with olive oil. They know how to sell to tourists, and they do so with such charm that one not only feels fortunate to have bought such tasty prizes, one also feels blest. The Sanremo market is always a treat. During this brief but determining trip to Italy, we were above all enchanted by three places that we had never visited before. 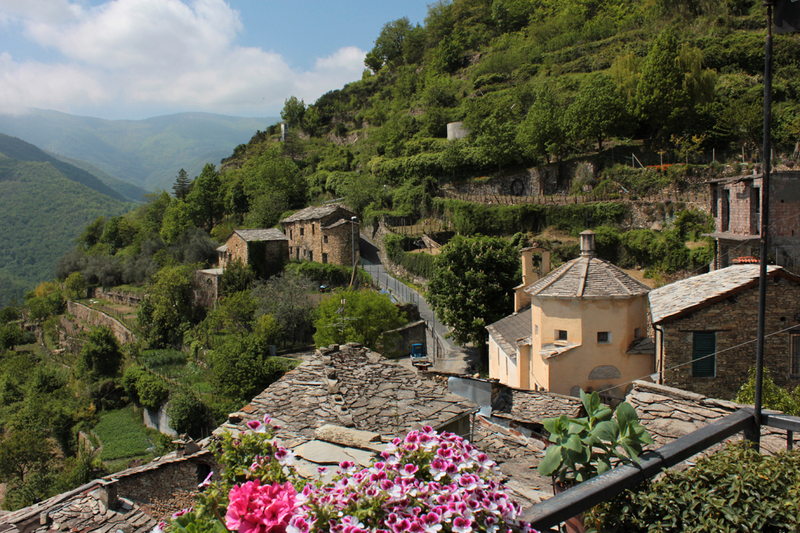 Apricale, which when you see this monumental medieval village for the first time as you approach it from the south, takes your breath away. It was founded in the tenth century and prides community statutes considered to be the oldest in Liguria. They were established in 1267. In the main plaza there's a good restaurant. All the more palatable because surprisingly it doesn't exploit it's privileged location. It's very reasonable indeed. This is a banal summary of a beautiful, historical village, but it was a short visit, and the pleasure of seeing such a place is bound to be enhanced by a good meal there. In fact whilst eating one can easily imagine the square during the Renaissance with groups of habitants in their exquisite costumes elegantly strolling by the walls, gesturing as they converse. The waiter poured a little Piemonte frisante into my glass to taste. I nosed it's bouquet as one does, and felt a fine thread of cobweb attach itself to my nostrils, which made me roar with laughter. The poor waiter must have thought I was mad, or that the sparkling wine caused an immediate hysterical reaction. But such a trattoria in this féerique, medieval village certainly deserves more customers during the month of May, than money spiders. Then we passed by Dolceacqua, founded in the twelfth century. 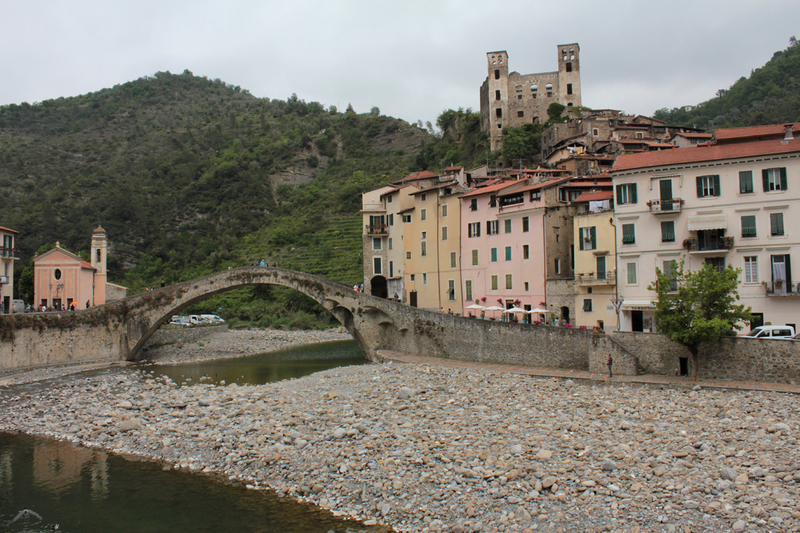 It has a splendid bridge spanning the river below the castello ruins dominating the old original village. I conti di Ventimiglia (the Counts of Ventimiglia) were responsible for beginning the construction of the castle which later in 1270 was acquired by the Genovese, Oberto Doria, hence its name il Castello dei Doria. During the successive centuries the Castello was improved upon, but the conflicts between the factions of Guelfes and Ghibellines, and the rivalry between the families Doria and Grimaldi during the 16th century led to Dolceacqua being part of the protectorate of the Casa Savoia (1524). We also visited Balestrino, in the Provence of Savona. Sadly the old, original and far more picturesque town on its hill, is now a ghost town. It was abandoned in 1953 due to hydrogeological instability. In fact its instability is considered too dangerous to allow anyone access to explore the ancient town. Compared certainly to the new Church built in the more modern replacement town of Balestrino below, it's far more interesting and pleasing to the eye, which is hardly surprising. However, it would be fair to add that the interior of the new Church is more to its credit than its exterior. 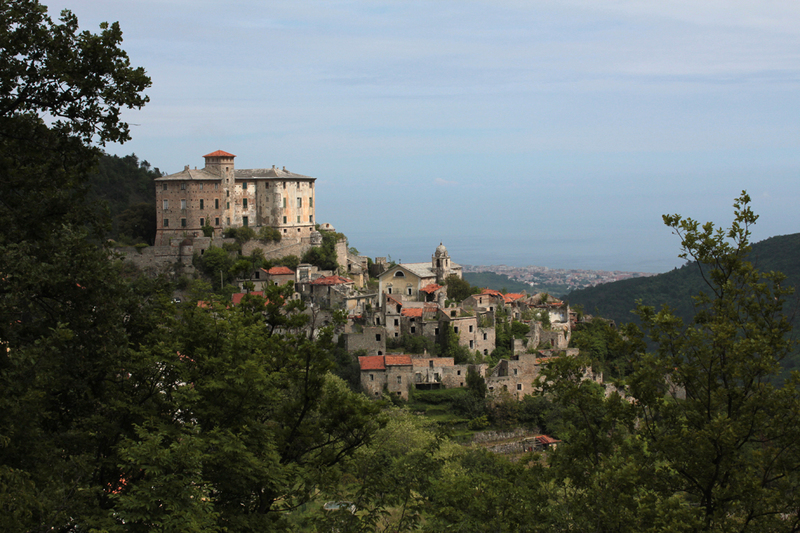 The third surprise was Cenova, Rezzo, of the province of Imperior, still in the region of Liguria. The village of stone where all the roofs are made with what seems to be large, thin, slabs of stone, rather than slate. Cenova is also a medieval village. It's a monument in itself, and perhaps more so in view of its meagre population of less than sixty people. 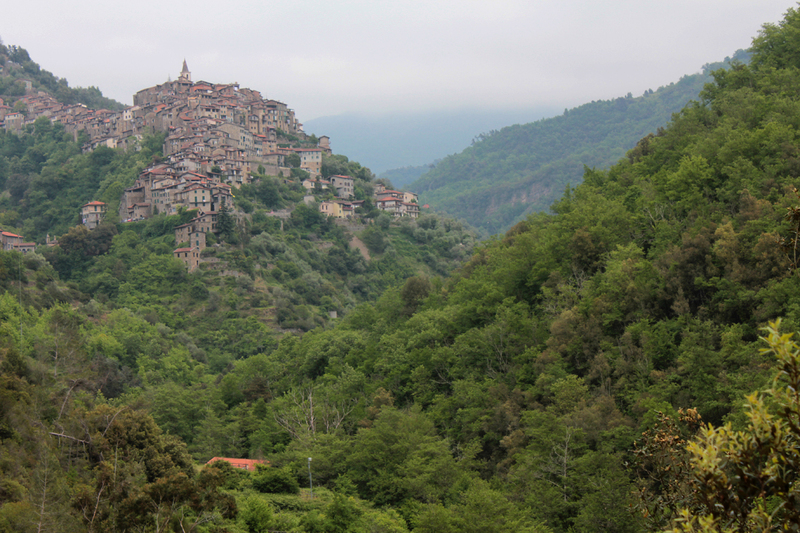 It faces south and one imagines the village to be much higher than the mere 558 metres above sea level than it actually is. Hopefully I shall have more to write about Cenova in the future, depending on the evolution of circumstances and events.